The JKBOSE 12th Result 2019 is the most awaited result for the students of Jammu and Kashmir in the 12th standard. The Jammu and Kashmir Board of Secondary Education (JKBOSE) is the body responsible for declaring the JKBOSE 12th result 2019. The tentative date of declaration of JKBOSE 12th result 2019 is the last week of April. The JKBOSE Class 12 result 2019 will also be published online on their official website once it is formally announced. The publishing of the results online will make it more convenient for the students to check their result. A live link to check the JKBOSE 12th result 2019 will also be made available on this page as an alternative option for the students to check their result. Students should, thus, bookmark this page for all the latest updates and information about JKBOSE 12th result 2019. JKBOSE has maintained a complete silence when it comes to announcing the JKBOSE 12th Result 2019 date. The JK Board usually takes 50 to 60 days to release the results, once the examination is completed. Considering this and taking cue from last year, the JKBOSE Class 12 result 2019 for all streams including Arts, Commerce and Science can be expected by the last week of April (summer zone) and in the first week of January (winter zone). Experts suggest that the Jammu and Kashmir result 2019 will be announced as per their annual academic calendar. Once announced, the students will be able to check the result on the official website. While this is a speculative timeline, the board is likely to come up with the official notification of the JK Board Result date soon. Our team would provide all updates about the JKBOSE Class 12 Result 2019 here on this page. You can also register for our email alerts service to receive all updates about JKBOSE 12th result 2019 directly in your inbox. Fill in the form provided at the top of this page to avail this service. Where to Check JKBOSE 12th Result 2019? Once the examinations are over, the JKBOSE will soon announce the 12th Result 2019 which will be accessible from the official site i.e. jkbose.co.in. To check the important news about the JKBOSE Result 2019, the students can visit this page consistently. Our team would share confirmed and valid news and updates about JKBOSE 12th Result here. On the day of the result, the official website may slow down due to the large number of users on site. In such a case, Jagranjosh.com – India's No. 1 education site is the best option to check the result, apart from the official website. From this page, the students will have an option to check and download the scorecard. Statistics from previous years’ JKBOSE 12th result will help the students to understand the trend and set realistic expectations from their result. It also helps students to calm their nerves and understand the evaluation procedure and strictness. For this purpose, we have presented last year’s JKBOSE 12th Result analysis below. The JKBOSE 12th Result was announced on April 25 last year. Only 69982 students were allowed to sit for the JKBOSE 12th exam as a means to improve the overall pass percentage. The JK Board announced results of all the three streams i.e. Arts, Commerce and Science at the same time. The JKBOSE Board is expecting that the pass percentage of students will increase in 2019. The number of students is increasing year after year under the Jammu and Kashmir Board of School education and all the students are putting in their best efforts to achieve good scores in the 12th Class Examination. After the formal declaration of JKBOSE Result 2019 from board office, the scores are made available online on the official website i.e. jkbose.co.in. However, the official website is often down with some technical problems. Such problems can create unnecessary anxiety among the students of the 12th class. So, apart from the JKBOSE official website, the JKBOSE 12th Result 2019 will also be available online on Jagranjosh.com. Below we have also listed down the key steps using which you can check your JKBOSE Result online. It is advised by the board that all the students who are eagerly waiting for the JKBOSE 12th result 2019, should keep their essential details like roll number, date birth certificate, mobile number and email address with them while visiting the website for checking the result. What after JKBOSE 12th Class Result 2019? 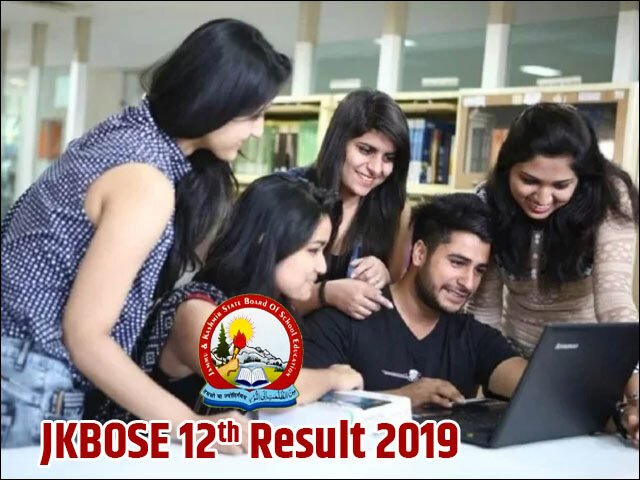 Post the official announcement of JKBOSE 12th result 2019, students should download and take a printout of the result page for future purposes. The JKBOSE Class 12 Result 2019 will be available through the link provided above. The downloaded copy of the JKBOSE 12th result 2019 will act as a provisional status of qualification until the original marksheet are issued by JKBOSE. The original mark sheets will be delivered to the respective schools within the stipulated time after the declaration of JKBOSE Class 12 2019 Result. The declaration of JKBOSE 12th result 2019 will evoke mix responses from the students. Some might find joy and express a sigh of relief while others may be disappointed with their JKBOSE 2019 result for Class 12. The students who are not satisfied with their marks and believe that their answer scripts have not been properly evaluated will also have an option of re-evaluation and re-checking their answer sheets. The students can take benefit of this particular provision by paying a nominal fee as directed by the concerned and submitting an application through their respective schools/institutions. Students who fail to make it to the passing mark in the JKBOSE 12th result 2019 despite their best efforts can appear for JKBOSE Supplementary/Improvement Exam for Class 12. This exam gives the candidates with a second chance to improve their scores in a single or multiple subject(s). Students can apply for appearing in the supplementary/improvement exam of JKBOSE Class 12 by filling in the application form that will be made available on the official website. The Jammu and Kashmir Board of School education is popularly known as JKBOSE, was established in the year 1975, and has a number of affiliated schools. Both private and government schools are affiliated with this famous education board. The Jammu and Kashmir Board of School Education is divided into 2 separate zones - summer and winter zone which have more than 12 sub-offices in the state. The JKBOSE is very important education board of Jammu and Kashmir that is entrusted with the responsibility to create syllabus and textbooks and to specify the courses of instruction for students. Not only that, the board also provides a number of facilities to the students including a library, different types of sports and computer lab. The JKBOSE works as a governmental body which is responsible for all development and maintenance of Jammu and Kashmir school education. The JKBOSE takes all the responsibility to conduct the 10th and 12th exam in an organised manner. The main mission of the board is to make a strong base for higher education which should be effective for all students of Jammu and Kashmir. Jammu and Kashmir State Board of School Education has postponed JKBOSE Class 12 Board Exam 2019. The exam is postponed due to the ongoing curfew in Kashmir. Click here for further details. JKBOSE 12th Exam Date Sheet for Jammu region has been released by the Board. The JKBOSE Jammu Province Class 12 Date Sheet can now be downloaded from official website jkbose.ac.in.